Imagine for a moment that the Games for learning research project is a comic book, and the teachers who are part of our study, a motley crew of superheroes. Not superheroes born with supernatural powers like Superman, but do-it-yourself superheroes like Batman, who sharpen their wits and fashion their own utility belts as they answer the call to teach. Let’s say that games are among the tools on their teaching utility belts. If this was a comic book, sooner or later we’d have to delve into the origin stories of our protagonists. How did they become game-using teachers? Were they lifelong gamers, or was there a pivotal moment in their teaching histories that opened the door to games and gaming? How do games feature in their classrooms now, and what can other teachers learn from their stories? Over the next few weeks I’ll be sharing the game-using origin stories of some of the different teachers in our project. We’ll look at how they got started with games, and what they and their students are actually doing with games. If you’re a game-using or game-curious teacher, I wonder if any of these stories will resonate for you? Some teachers’ motivation to use games comes from their own longstanding enjoyment of games and gaming. They understand exactly why games can be motivating and enjoyable for students, because they feel the same way. Gamer teachers in our study include Imogen, Pete, Jeremy, Justin, Andrew, and Carl. Their individual game tastes vary, from classic Nintendo, to competitive sports videogames, boardgames, strategy games, and complex role-play games. Just as their own game preferences vary, each also brings games and gaming into their teaching in different ways. In today’s blog we'll meet Andrew, a secondary history teacher whose game-based learning practices are based around board games and role play. 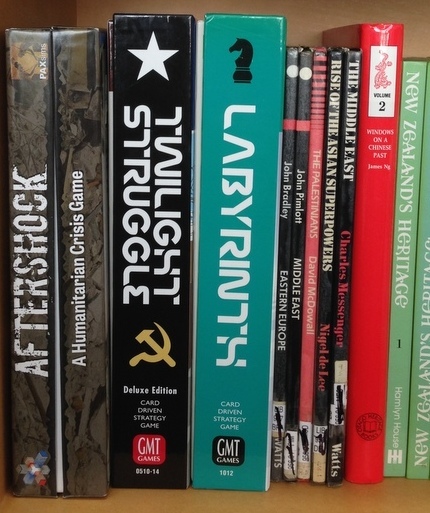 Andrew’s office shelves are stacked with a range of strategy, role-play, and board games that deal with socio-political and historical scenarios. Andrew can reel off the names of games you have probably never heard of. In fact, he can reel off the name of game-building frameworks and game designers that you have probably never heard of. Games like Andean Abyss, Diplomacy, and Matrix Games. I’d have to consult my notes to get all of them, but you get the idea, right? Andrew first started using games in his history classes 6 or 7 years ago, motivated by a frustration that senior history teaching wasn’t going far enough in getting students to think about the complexity of social history. He started off by bringing the Diplomacy game to his students, after they had been studying the origins of the First World War. A major driver for this was to develop students’ historical empathy – the ability to relate cognitively and emotionally to history, understanding how people from the past thought and behaved which “may lead to students making open-minded choices when encountering diverse perspectives in the here and now” (Davison, 2010, p. 83). Playing a game was one way to put students into a particular role or situation that could get them thinking differently about history. This early experiment proved successful, so Andrew continued to explore the potential of other games. He began actively looking for recommendations for simulations or role-play activities to use in history classes, and reading about their strengths and weaknesses. Andrew has now developed a lot of experience getting students to play all different kinds of games. He is always thinking and reflecting on what is working and where it could go next. An important aspect of game-based learning in his class is the explicit discussion that happens before, during, and after the actual game play, and the importance of framing up the purpose of the game. One of the key reasons for being careful and considered in how he prepared for, and introduced games into his classroom was an acute sensitivity to potential ethical issues that could arise. Because of this, Andrew considers his relationship with students and knowledge of what they are ready for to be crucial. He won’t bring particular games in until he feels confident that a class of students are ready for it. Recently, Andrew has begun collaborating with an experienced colleague in his department who was curious to learn more about the game-based approaches Andrew has developed. They’re now planning their programme together and running it in their respective senior classes. Having a reflective critical friend has already proved valuable. He has passed that critical eye over what I’ve been suggesting and said “So what’s your point? Are you sure you’re doing this for our educational outcome or do you just want to make that next 50 minutes fun for you?”. It’s good to have that critical friend when you’re doing these things. I asked Andrew to sum up how his use of games related to his overall thinking about the purposes for teaching history at school. I think it’s about preparing students to be able to participate in society with at least some information about the deep complexity of the world that they live in, that right and wrong are very difficult ideas, that you can’t just take a stand, you need to take a stand appreciating that [it] comes at a cost, or it comes at a compromise. I couldn’t put it in a nutshell but I think you get the gist of that, it’s about participation, about pragmatic and idealistic participation in society. Later this year we hope to visit Andrew's class to see one of the role play games in action, and talk with students about how this has impacted on their learning. Andrew has also raised the idea of running a session with teachers and other adults who are interested in how these games work and how they might apply them in their own school and classroom contexts. (If this sounds like something you might be interested in, please get in touch!). Interested in thinking more about the use of games in history and social sciences? The PaxSims blog is devoted to the development and effective use of games and simulation-based learning concerning issues of conflict, peacebuilding, and development. Play the Past is dedicated to thoughtfully exploring and discussing the intersection of cultural heritage (very broadly defined) and games/meaningful play (equally broadly defined). I also recently watched the thoroughly enjoyable documentary World Peace and other 4th Grade Achievements. You can view the trailer here. Davison, M. (2010). The case for empathy in the history classroom. Curriculum Matters, 6, 82–98. Great post and with a surprise for me. I didn't think I'd relate to Andrew at all but in fact I did! The bit that got me was his interest - which I share - in putting people in particular roles and situations in order to start thinking differently.